Have you been in Mel’s on Main recently? You know Mel, don’t you? Spiked mustard-colored hair and prickly attitude? Don’t let the attitude fool you, though. She’s a chef with a heart of gold and a knitting obsession. Anyway, she’s tinkering with the café’s menu and trying new recipes again. 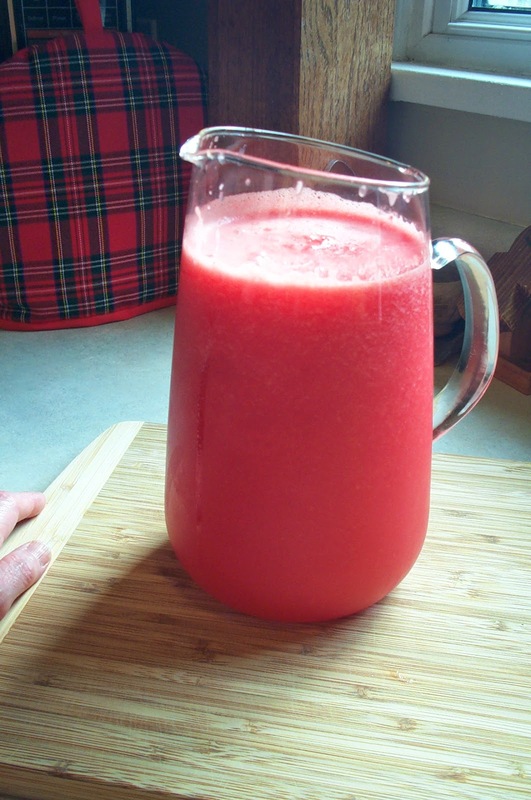 She’s brought back the summertime favorite – rosemary-infused watermelon Lemonade. And she’s getting deliveries of locally grown fresh berries for the fruit salad. Scallion bread is new and superb. 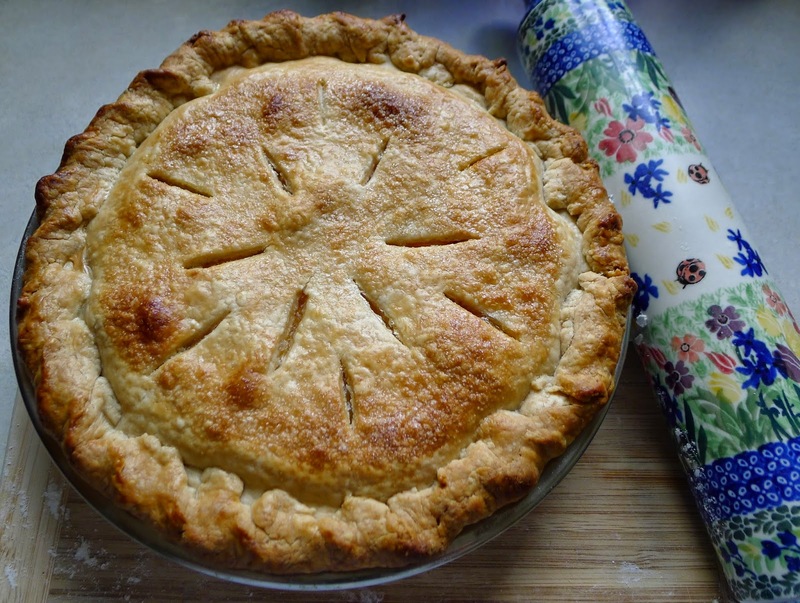 Peach pie isn’t new – but it’s fabulous. And vanilla beet ice cream is something you have to see and try for yourself before you’ll believe it. 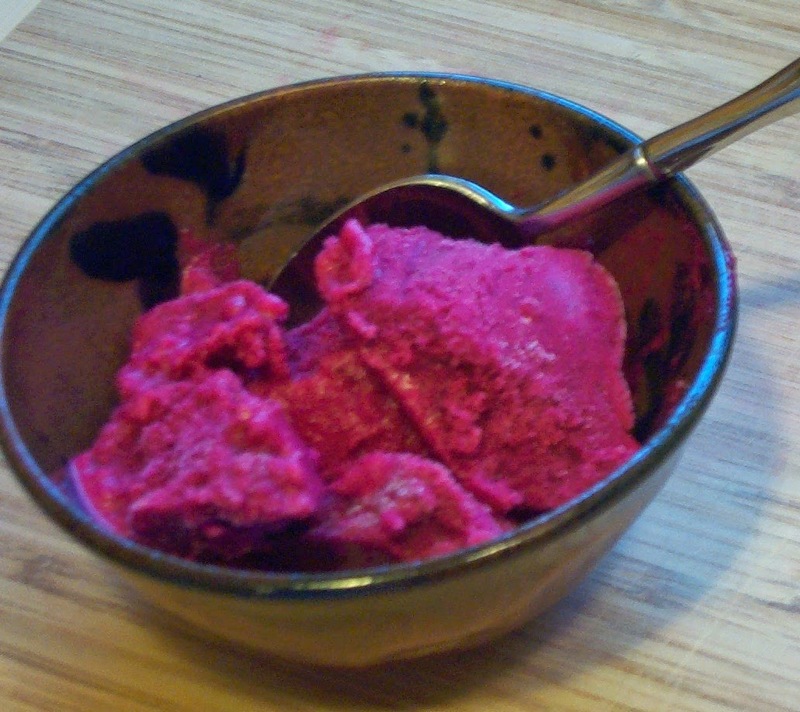 I know what you’re thinking – beet ice cream? Really? Yes, really. The color is startling and the taste is . . . amazing. I sound like a paid advertisement for the café, don’t I? The Weaver’s Cat and Mel’s on Main are trying cross-promotion this summer. Ardis and I are talking up Mel’s and handing out her menus. In return, Mel is reserving one of the tables in her front window for knitters, crocheters, spinners, quilters, embroiderers, and fly-tiers during June and July. Bring your needles, hooks, spindles, and fibers to the cafe and the coffee and tea are on the house. This kind of cross-promotion can’t hurt, and it’s fun! Here’s something else that's fun in June and July - every day through July 30th, the Killer Characters are giving away books for your summer reading pleasure. 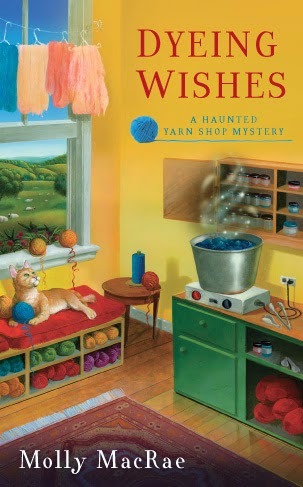 Leave a comment by midnight 6/23/14 for a chance to win an audiobook of a Haunted Yarn Shop Mystery – your choice of LAST WOOL AND TESTAMENT, DYEING WISHES, or SPINNING IN HER GRAVE. Be sure to leave your email address in the comment to be notified in case you are the winner. Kath Rutledge’s latest adventure is the national bestselling SPINNING IN HER GRAVE, third book in the award-winning Haunted Yarn Shop Mysteries, which are available in mass market, e-book, large print, and audio wherever books are sold. 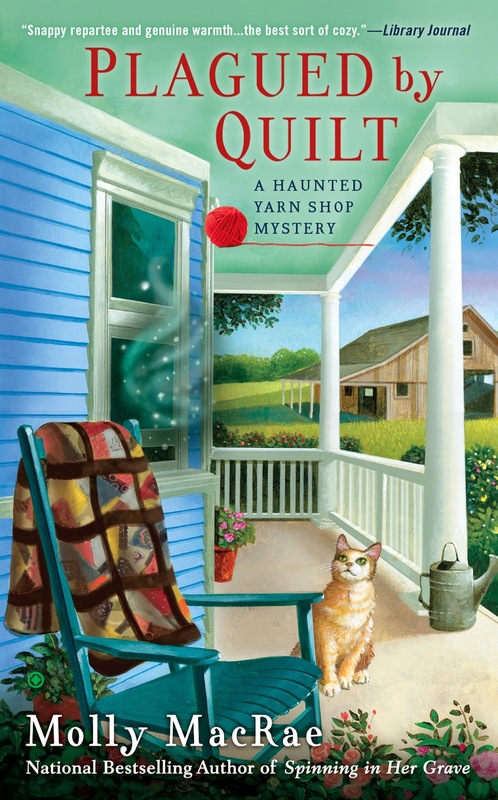 Watch for Kath in PLAGUED BY QUILT, coming in November 2014, and available now for pre-order. Beet ice cream sounds different. It sounds like fun to sit and knit while at the cafe. Can you crochet as well? Crochet is more than okay! I should have included that, Debby. Now Mel will be on my case. Thanks for stopping by the blog today. There, Debby - this is better - crocheters are welcome at Mel's table, and so are spinners, quilters, embroiders, and fly-tiers! Thanks for the prompt to fix the post! 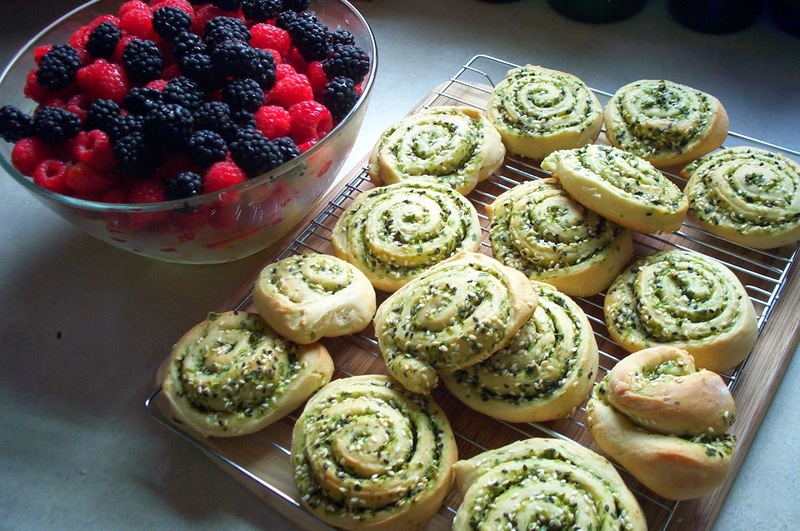 The Scallion bread sounds really good! Alas, I have no yarn skills (making beaded jewelry is my one crafty thing) but I am a ghost hunter so maybe I could help in the yarn shop in a different way. Ghost hunter! How cool! Not that I'm admitting anything about ghosts or being haunted . . . The peach pie sounds great. I've only ever made apple pie. I haven't read any of the books but they sound interesting. Apple pie is definitely good, Christine. And Mel's peach pie is wonderful. But my favorites are cherry pie, rhubarb pie, and gooseberry pie. Mmm, I haven't had gooseberry pie in years. These sound very interesting and would love to add them to my TBR stack. Thanks for stopping by, Becky! I hope you give the books a try, sometime. Good luck in the drawing! "Last Wool and Testament" would be my choice, I think. Anyway, I don't knit but I have taken up crochet again and I need to come to your shop ASAP, as I have run out of yarn for a project I am working on. It involves 63 different stitches for squares to sew together. And so far I have figured out 32 of those stitches. I would be interested in trying that Vanilla Beet ice cream. My husband, not so much. I'm using a book called "63 Easy-to-Crochet Pattern Stitches" and using Lily Sugar'n Cream yarn in all different colors so it will be crazy when I finish! Very colorful! What a tasty post, Kath! All my characters will be very jealous. Thanks, Mary Jane! Can you tell I hadn't eaten lunch before I wrote that? Beets are so sweet, that ice cream must be wonderful. It is, Libby! It's beautiful, too. Thanks for stopping by. I haven't met a piece of pie that I didn't like, so beet pie...I'm hopeful. Knitting or crocheting in a cafe sounds heavenly. Actually, it's beet ice cream. The pie up there in the picture is peach. But now that you mention it, I bet Mel would like the idea of beet pie. I'll pass that along. Thanks! Thanks for stopping by, Sue. Good luck in the drawing! I'll take your word about the beet ice cream. Make it a blueberry pie or blackberry cobbler and I would stop by every day. Now the fruit salad looks like it might actually be the first one I might actually enjoy. I have never heard of scallion bread, that might be interesting. I really need to stop by the cafe again soon to take a closer look at all the new items Mel is offering. Would they ladies be terribly upset if I admit that I prefer to crochet, than to knit. I reserve knitting to layettes everything else I crochet. DelAnne, you stop by with your crochet and the ladies will treat you to some of that fruit salad! I can't believe I left crochet out of the post. I think I'll go in and fix that. You should try the ice cream, Melanie. Mel (short for Melody) uses coconut milk. Delicious! That all sounds wonderful except the vanilla beet ice cream. I don't eat beats. Thumbs up to the rest. Aw, sorry about the beets. But there's plenty else at Mel's to tickle your taste buds. Thanks for stopping by! Thanks for stopping by. Good luck in the drawing! You're brave and kind! Thanks for stopping by. And Mel will be happy to have you stop by to sample any or all of them! You'll find the cafe on Main Street in Blue Plum - and pictures of it on our author's Pinterest page. Never too late, Susie! Stop by the Weaver's Cat and we'll give you a free lesson. Not sure how beet ice cream would taste. I love cold beet soup! Then you need to try the ice cream, Amy. It's made with coconut milk. It's not overly sweet, but boy is it delicious (and gorgeous)! Love to read about new books and authors. Thanks for stopping by, Charlotte! I was on vacation in MN last week and while in St. Cloud I saw a sign for a store that said "Coffee, Desserts, Yarn." 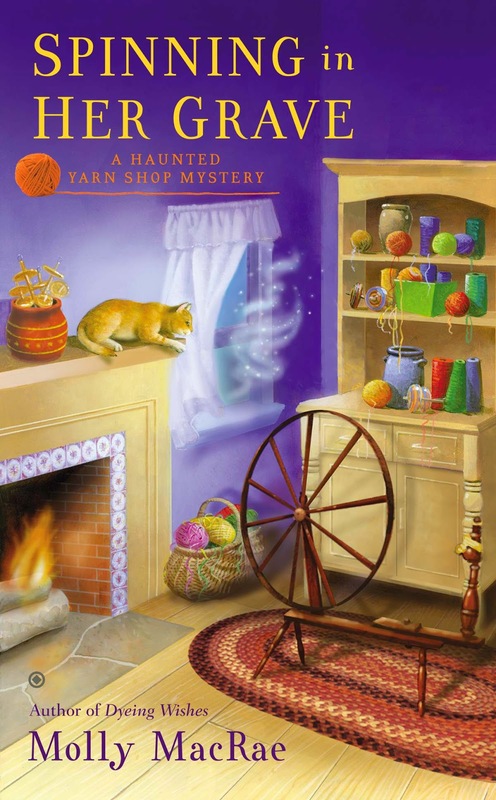 For some reason I thought of the Haunted Yarn Shop mysteries! Fantastic! Thanks for letting me know. Thanks, Ronna! Argyle isn't much of a yarn chaser. He thinks of himself as a retired gentleman cat. I love beets and I love ice cream, but I'm not sure about beet ice cream. That's one to think about. I loved the way this post was written in what I am guessing is the voices of the characters. And I have to say that the Watermelon Lemonade things sounds yummy!! She sounds like my kind of girl! Knitting is my peaceful place. When things are getting a bit too much, I start a knitting project. Your books sound wonderful. There are so many other craft forms. String art, weaving, bead work, macrame, tatting (lace making), scrap booking, ceramics and so much more. Never give up Kathy Gonzales you will find one to suit you. As for learning to crochet or knit perhaps you have not found the right teacher for you. Although i don't knit or crochet, the first book in this series is on my kindle and my TBR list. I love to crochet, and I love to read books that sound cozy. Beet ice cream sounds tasty to me---but then I really like beets. Made a beet chocolate cake a couple times and it's pretty good, too. I'm a knitting beginner as well. My grandmother taught me crochet when I was a child. My mother still has some of the baby clothes Grandma made for my brother. This book sounds wonderful. Cozy mysteries can be so fun and light.